Mix dry ingredients first, then add vanilla, eggs and cream stirring until smooth and creamy. 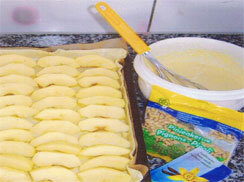 Distribute pastry evenly in baking pan, push in apple slices, pour mixture evenly on top and sprinkle pine nuts. 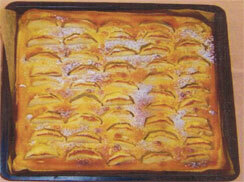 Place in pre-heated oven to 180° C for 30-40 min. until golden brown. In food processor, mix flour and salt, then pieces of shortening and butter. Process until mixture resembles crumbs, add cold water through food chute with processor running until a ball is formed, about 30 sec. 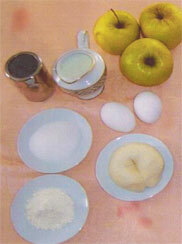 Pastry will not always form a ball and longer processing toughens pastry so you can knead and shape ball by hand.